From time to time, you might find yourself changing the domain or location of your WordPress installation. A side-effect of doing this can be the left-over, hard-coded references to your former URL. In this quick tutorial, I’m going to show you how simple it is to update all references to your old domain by doing a MySQL query to find and replace all instances. 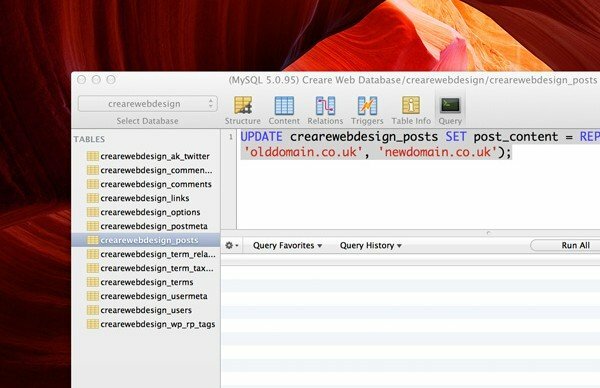 Whether you’re setting a locally developed installation live or simply changing domain names; having left-over remnants of your old location can be a real nuisance.Â ParticularlyÂ as the 404s might not show up until your own computer’s cache of the domains has been updated. 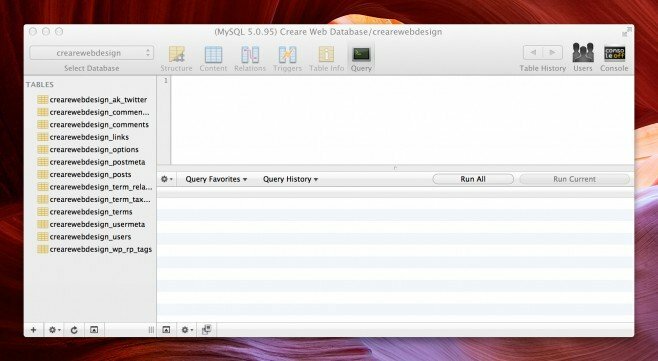 To begin, you need to connect to your newly transferred website’s database. You can do this through any access point, however if you’ve never accessed your database before, then i’d recommend downloading some free software like Sequel Pro for Mac that will allow you do to do. Now that you’ve connected to your MySQL database, performing the query is very straight forward. And paste this into the window in fig.3. Next you simply need to change the ‘crearewebdesign_posts’ table reference in fig.4 to match your Post Table name that we mentioned in Fig.1. Finally you simply need to change fig.5 and fig.6 to match your former and new domain/destinations. To run the query, simply hit the ‘Run All’ button (fig.7) and the outcome of the process will be summarised for you in the bottom console, as shown in fig.8. That’s it! 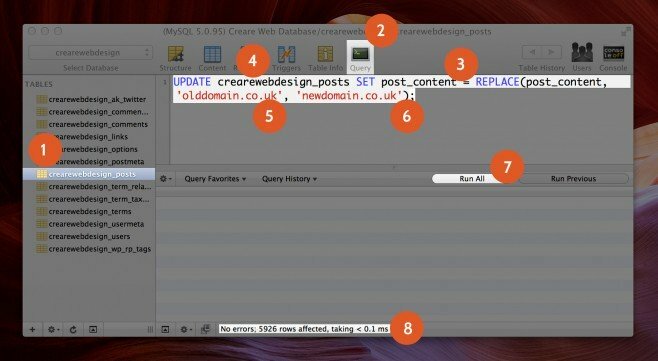 Make sure you check the front-end of your website after completing the query to ensure that everything is working as expected. It’s always worth backing up your database before performing any query or change to your data.